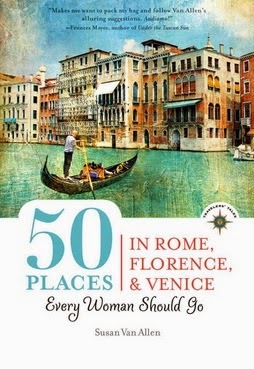 Discover the best places for women in Rome, Florence, and Venice with travel book by author Susan Van Allen. Synopsis: Following the critically acclaimed 100 Places in Italy Every Woman Should Go, Susan Van Allen adds new gems to her selection of the best spots for female travelers in Italy's most popular cities, along with enticing Golden Day itineraries to make vacation dreams come true. Like a savvy traveler girlfriend whispering in your ear, she guides readers to masterpieces where women are glorified ~ from Rome's Pieta to Florence's Birth of Venus ~ and to the best spots for wine tasting, chocolate, gelato, artisan shopping and more. She provides practical tips giving readers an insider's secrets on what to pack, the best places to get their hair styled, and how to shop for bargains. Whatever your mood or budget, whether it's your first or twenty-first visit to Italy, 50 Places in Rome, Florence and Venice Every Woman Should Go opens the door to extraordinary experiences that fully immerse you in the beautiful, fascinating, and delicious pleasures of the Bel Paese. * I received a complimentary copy of this book for review. My Thoughts: My husband was born in Italy and raised there until the age of 5. His family then immigrated to the U.S. and have lived here since. Over the years many of his extended family members have traveled to visit with us but let's face it, it is now our turn to visit Italy which we plan to do in January 2016. This travel book is extremely well-written and I love how the author has everything broken down nicely in 3 easy-to-read sections: Rome, Florence and Venice. Then she has various chapters listed within each section. I think this is fabulous because if you are only interested in Rome...you don't have to search the entire book to find what you need. The author gives you great ideas on where to eat, what to see and things you can do. I like that she includes outdoor things like biking and hiking to indoor things like hitting the local spa or taking in a live music show. There is definitely something for every woman to enjoy listed within the pages of this book. Overall, it is an exceptional read! If you are looking for a travel book that contains a lot of pretty pictures, this book is not for you. It is more of a personal guide book than a coffee table book with pretty photos. It has given me some great ideas on the things I want to see and do when we visit Italy in 2016. You can learn more about this author and the book by visiting her website online. You can purchase the book via Amazon. Disclosure: Shelly Hill received a complimentary copy of this travel book for her review. No monetary compensation was provided/received. Shelly's thoughts about this book are 100% honest and unbiased. Your thoughts and opinions may differ.